A note about the milk: It’s best to use whole milk in this recipe for the ideal creamy texture. However, if you’re counting calories, you can swap the whole milk for 2%. I do not recommend using 1% or skim milk because it will make the soup too thin, and it won’t have the correct creamy consistency. If you find that the soup is a little too thick for your liking, you can thin it with more chicken broth if necessary, in 1/4-cup increments. Store any leftovers in an airtight container in the refrigerator for up to four days. This recipe is gluten-free, and also vegetarian-friendly if you substitute vegetable broth for the chicken broth. 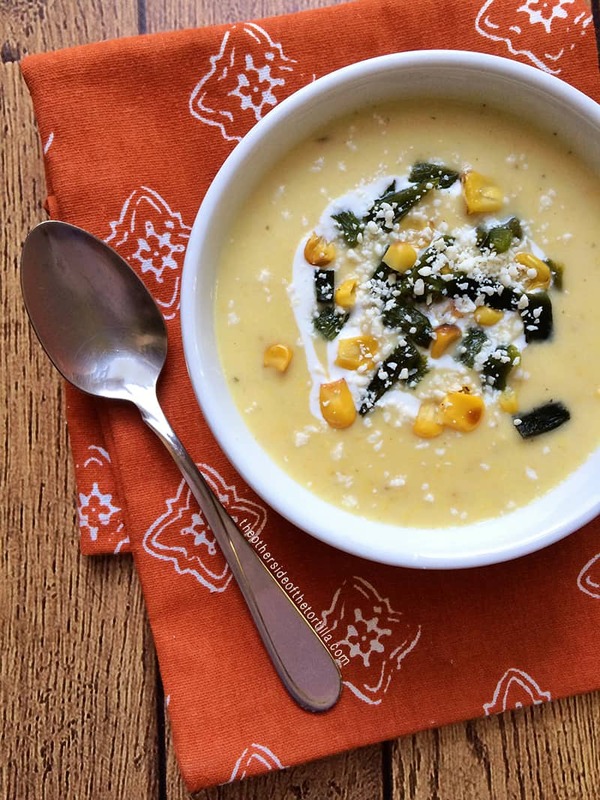 Crema de elote is a hearty, Mexican version of cream of corn soup. 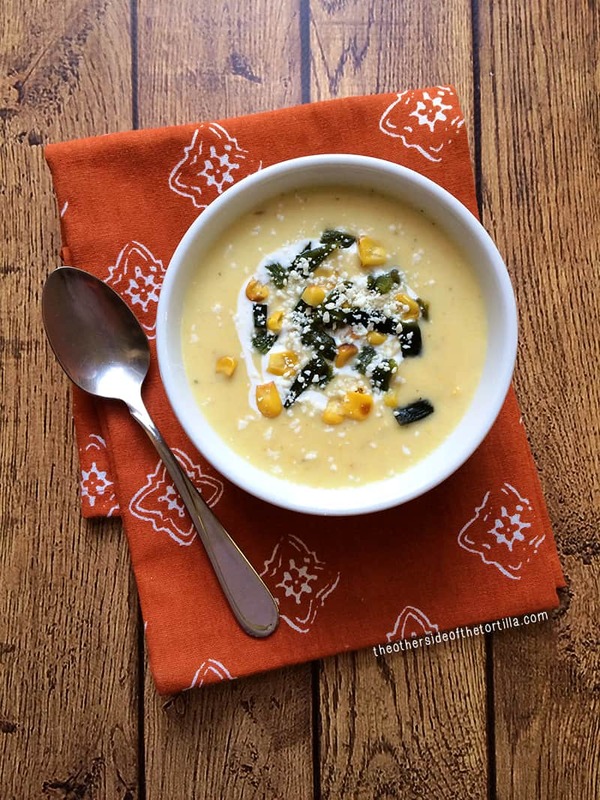 Garnished with roasted corn, diced chile poblano and topped with a swirl of crema mexicana and a sprinkle of queso cotija, this soup is perfect for cold winter days. Roast the poblano chile on your stove and place it in a plastic bag to sweat. Set aside. Spread the frozen corn on a parchment paper-lined baking sheet and put under the broiler on high for 10-12 minutes. Corn should start to roast but should not turn completely brown. Remove from broiler and allow to cool for 5 minutes. Set aside 1/2 cup of the corn for garnishing and put the remaining 3 cups of roasted corn in a blender or food processor. Add chicken broth, whole milk, onion and salt to the blender and run on high until completely smooth. Transfer soup to a saucepan and cook over medium heat. Whisk in 1/4 cup Maseca instant corn flour and stir frequently. Continue cooking over medium heat for about 5-7 minutes, until heated through. Move saucepan to a back burner, cover with a lid and allow to cool slightly. Peel, seed and dice the poblano chile. Divide the soup between two bowls. Use a spoon or small chef’s squeeze bottle to drizzle a swirl of crema mexicana on the top of each bowl of soup. Garnish with roasted corn and diced poblano chile. Sprinkle 1/2 tablespoon of queso cotija over the top of each bowl. Serve. This Crema de elote looks amazing, I love it and want to try it soon. I thought this soup was wonderful. If you have a Vitamix blender you can roast your corn and the poblano Perrier but everything else is down in blender with the soup button and wow did it turn out great!